Is Your Pet an Unwilling Host? Is your pet an unwilling host for fleas? If so, check out a new product called the Flea Zapper. 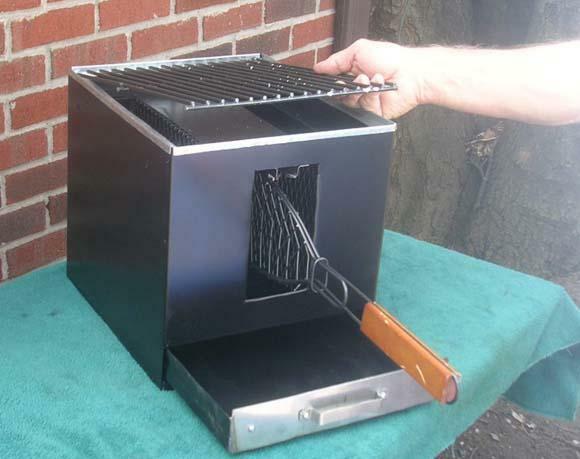 Developed by Epilady, a company known for their body-care products, the Flea Zapper is a unique, fully developed, and effective product to remove fleas from household pets. Epilady is working with InventionHome.com to to assist them in finding licensing opportunities for the patented product. The Flea Zapper is a chemical-free device and is ideal for most pets, including dogs, cats and even geriatric animals. It is also less stressful for the pet than other treatments such as sprays, chemical baths, etc. By simply combing the pet’s hair with the Flea Zapper, fleas are eliminated. Most pets even enjoy this combing action! Using the Flea Zapper is easy… Simply turn on the comb and run it through the animal’s fur. Whenever the comb’s teeth come in contact with a flea, it will be killed instantly. The product has been extensively tested and complies with the rigorous ISO 9002 international quality management standard. To learn more about how InventionHome.com can help you find companies interested in licensing opportunities, please call (866) 844-6512. Great to Use on Cats!Equally Effective on Dogs! Monroeville, PA– InventionHome is pleased to feature a patent-protected tool for splitting pills of any shape called the Rotatable Pill Splitter. Independent inventor Walt Cheney is working with InventionHome to market and license his product to companies in exchange for royalties. Walt created, prototyped and was awarded a utility patent from the United States Patent and Trademark Office for his tool that gives individuals the option to halve and quarter pills with great accuracy. 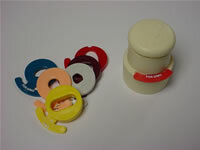 The product consists of a lid and base with interchangeable pill beds in a variety of colors to accommodate a number of standard and unique pill sizes. When the user wants to split a pill he selects the correct bed to match the pill size and inserts both into the device. The pill bed holds the pill into the proper position and aligns it with the blade below. The user rotates the outside lever of the pill bed and presto….the pill is split! This is a great product for any individual who has a difficult time cutting a pill of any shape. How many times has a doctor increased or decreased the dosage of a frequently prescribed drug and decided to write a new script for the medication? In many circumstances the individual could have a supply at home and would love to split or quarter his previously purchased meds to get the right dosage. 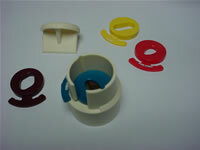 The Rotatable Pill Splitter allows the user to be economical and accurate with his medication. InventionHome continues to market Cheney’s product to interested companies. For more information on the Rotatable Pill Splitter or invention-related services please contact InventionHome at (866) 844-6512. Please Don’t Run With Skissors! Monroeville, PA – InventionHome is pleased to feature a patent-protected teaching tool for children called Skissors. Independent inventors Dawn and Bob Kenny are working with InventionHome to market and license their product to companies in exchange for royalties. The idea for Skissors began when the mom and dad team noticed their children handling scissors at home. Fearing their children could injure themselves, Dawn and Bob thought about solutions and created a prototype combining hole covers built into a traditional pair of scissors. The simple and effective prototype forces a child to properly insert their thumb and index finger the correct depth into the wholes and safely use the tool for home and school projects. The Kenny’s product was awarded a utility patent by the United States Patent and Trademark Office. InventionHome continues to market the Kenny’s product to interested companies. For more information on Skissors or invention-related services please contact InventionHome at (866) 844-6512. Invention Home announces their “Invention of the Week”. Independent inventor David Rice enlisted the help of Invention Home to assist him in finding marketing/licensing opportunities for his invention, “Pet Gard”. Are you a pet lover who wants your pet’s company at all times? Do you like to take your pet with you in the car, but worry about the heat rising as the animal sits awaiting your return? Inventor David Rice has designed the perfect product for you! Pet Gard is a heat and sound activated alarm system designed to warn pet owners that the interior of their vehicle has reached a dangerous temperature. The portable unit consists of two separate components: a monitor and a pager. The monitor is plugged into the vehicle’s cigarette lighter, which activates it. When the interior of the vehicle reaches a predetermined temperature (factory set), and three similar sounds are detected within 20 seconds, a signal is sent to the pager. The pager will beep until the user presses a “dismiss” button. The beeping will sound again, every 60 seconds, until the user goes back to the vehicle, checks on the pet and either resets the monitor or unplugs it. David has an issued Utility Patent as well as a finished sample.